There is a lot to be grateful and thankful today. And I had a lot of time to think of all the things that I have been blessed with. In fact, I had 10 miles to think of it all. 10 miles to remember that I have been given so much. 10 miles to feel happy and blessed. 10 miles to feel the love and peace that my Heavenly Father has given me. 10 miles to focus on what was truly important. And 10 miles to figure out what to do next. 1) running majority of my miles next to Jason, and as we ran we listed all the things we were grateful and thankful for - pretty neat way to make the miles go by faster. 2) Everyone of these people below cheered each other on. On every mile, multiple times, people were giving words of encouragement, high fives and even stopping to check in to see if you were doing all right. I was a recipient and a giver of both. This is the type of environment I get to workout in everyday. These are the type of people that are in my community at CrossFit Verve. 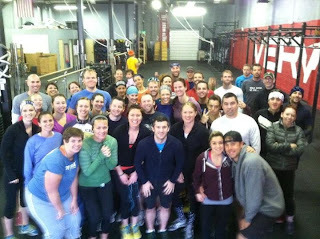 So today, I am grateful and thankful for CrossFit Verve. Not only do they kick my can each and every day, but they help me remember how truly blessed I have been. They help me remember that I am strong and that I can and will survive what ever life dishes out at me. They help me focus on how to better myself and be greater than myself. And they give me opportunities to provide those things to other people. I am not only greater than myself, but I am part of something larger than myself. Jason and I are still making decisions on what to do and when. But I know, because of how I have been prepared and trained, that I will get through it - regardless of the outcome. And I will be a stronger and better person because of it. 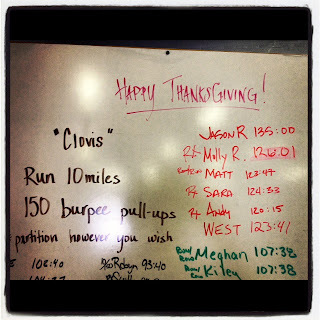 Thank you CrossFit Verve for giving me that. Molly -- I just saw your note in the Verve comments and came to check out your blog. I have been so impressed with you when we have worked out together and now am impressed with your writing! I'm glad to have learned about it. Love this post Molly! I wasn't sure if it would be okay with you for me to post your blog link on the Verve blog? Let me know and I can update it! Molly, I love your blog! You're an inspiration. And I've thoroughly enjoyed working out with you and your enthusiasm and words of encouragement! Thank you for sharing, Molly!